Whether you’re flinging angry birds on your phone or chasing aliens on your Xbox, video gaming has become a common part of society. The masterminds responsible, the game developers, have gotten really good at motivating people. It’s their job after all to create games that will engage players for as long as possible. The question I’ve begun to explore is this: how do they make “fun” happen using game mechanics? 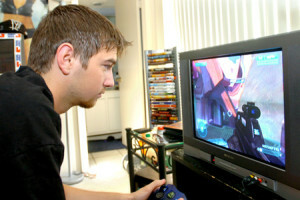 And more importantly, how can we take the addiction from games and use it to make people work? As it turns out, people who play games do so for at least one of these six reasons: competition, challenge, diversion, fantasy, social interaction, and emotional satisfaction. So let me describe each one and how they are used in Gamification. Competition: Just turn to your local sports channel during the World Cup or the Olympics and you’ll see. An entire nation of people will rally behind a sports team and cheer because they feel like they are competing against another nation. A sense of competition can engage an entire nation to a sporting event even if many of them did not have much interest in the game before. This motivation is utilized in gamification through the proper use of a leader board and a meaningful points system. Challenge: People don’t want an easy life, they want a challenging one. This is a tricky balance for game designers as it requires tasks both obtainable and sufficiently difficult. There should be a good understanding of what the players are capable of and how much difficulty they can therefore withstand. Diversion: The point is to draw the player away from stress. Be it the friends, challenges, story, or a beautiful design, game mechanics can help a player forget about the negative or stressful aspects of life. Diversion both draws a player into a game this way and also opens up the person to engage at an even higher level. Fantasy: Fantasy is about escaping reality for a more pleasant experience. People have been doing this since there have been story tellers. This game mechanic is used a bit differently in gamification mostly because we are concerned with injecting fun into the real world instead of stepping outside of it. Using narratives and stories, a proper gamification case will make the real world seem like a fantasy world. For example, a player could be defeating an evil scientist by learning about the different domains within his company. Social Interaction: Some like to focus on socializing more than on a good narrative or on completing challenges. For them, games are more about the people they play with than the game itself. In social games, rewards are given for completing tasks together or for sharing game content with other players or potential players. This is a common example of gamification and allows for both social interaction and help with marketing. Emotional Satisfaction: This is the feeling you get when you’ve worked hard for something and have earned a great reward for it. It is a sense of accomplishment that naturally comes from success and as emotional creatures we can’t help but want more of it. As much as quick and immediate feedback is important, people also need to receive an appropriate kind and degree of feedback for significant accomplishments. These six factors are what makes games so addictive. Using the above described game mechanics, Gamification reverse engineers this process and drives desired action. We should all be as addicted to work as we are to games! Michael was raised in Seattle, WA and is a third year economics student at Hillsdale College (as of 2014). He worked at Gametize in Summer 2014 to learn how he can use my economics knowledge for business development.